KERRY TRIBE: "EXQUISITE CORPSE" SCREENING AT DESCANSO GARDENS FOR THE GROUP EXHIBITION "LA REINA DE LOS ÁNGELES"
Without the Los Angeles River, there would quite simply be no Los Angeles. While the precise geography is unknown, historians have estimated it’s changed course at least nine times in the first half of the nineteenth century alone. La Reina de Los Ángeles will present a discussion of our current relationship with water, using the Los Angeles River as an entry point. 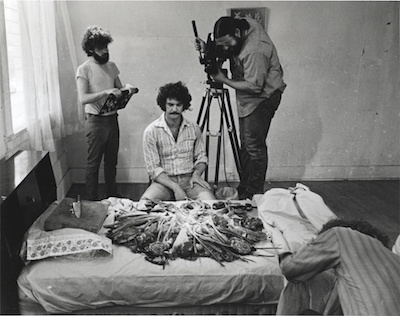 Through contemporary art works, documentary films, historic materials and special programming, La Reina de Los Ángeles will explore the history, infrastructure and community around this critical resource. Originally screened in 2016 at the CURRENT:LA Water Public Art Biennial, Exquisite Corpse is a 51-minute film that traces the 51-mile length of the LA River from its origin to its ocean terminus, capturing its varied landscapes, neighborhoods, creatures, and communities along the way. The film is presented as part of the La Reina de Los Ángeles exhibition curated by Debra Scacco at the Sturt Haaga Gallery. Kerry Tribe, Exquisite Corpse, still, 2016. Single channel video with sound. Tribe presents Exquisite Corpse (2016), a 51-minute film that follow the Los Angeles River for its 51-mile length from the San Fernando Valley to the Pacific Ocean. The film will play daily, from dusk to park close. Kerry Tribe will give an artist's talk with associate curator, Melanie Kress, exploring the history, production, and presentation of Tribe's video. 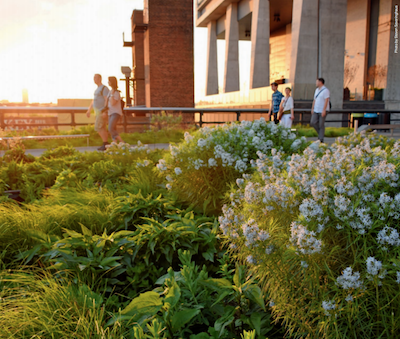 View of the High Line. Organized by The Broad and X-TRA, this special three-part iteration of The Un-Private Collection addresses the legacy of German Fluxus artist Joseph Beuys in relation to contemporary art practice. Each program highlights a theme central to Beuys and invites contemporary artists to discuss their work and ideas through that lens. 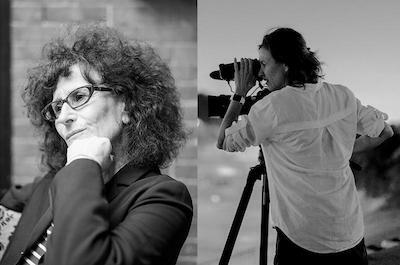 New York writer Lynne Tillman and Los Angeles visual artist Kerry Tribe will speak on lies and myth. Joseph Beuys is a controversial figure in art history, in large part because of his constructed biography: Beuys often recanted his dramatic origin story, a swirl of truth and lies, contributing to his mythic stature. In their work, Tillman and Tribe both investigate the construction of narrative and knowledge. This conversation will explore the ways that Beuys, Tillman and Tribe each raise questions about how identity shapes public reception and perception. Moderated by Shana Lutker, a Los Angeles artist and co-organizer of this series for X-TRA. Thursday, May 17, 2018 | 7:30 p.m.
Video still from Standardized Patient. Among its many characters, Los Angeles-based artist Kerry Tribe’s sharp and riveting video at SFMOMA, Standardized Patient, features a woman in a doctor’s office who isn’t quite sure why she’s there. Standardized Patient tracks doctors-in-training interacting with “standardized patients”: actors portraying characters with specific motivations, family backgrounds, personalities, and sets of symptoms. The camera follows the doctors as they discern the actor-patients’ ailments and communicate a treatment plan. New Work: Kerry Tribe, 2017. Installation view, SFMOMA. Photo: Katherine Du Tiel. Can empathy be taught? 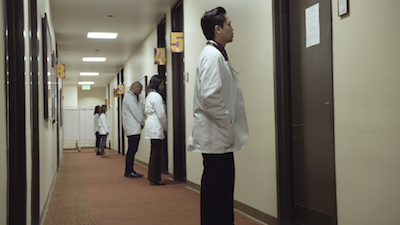 The Los Angeles–based artist and filmmaker Kerry Tribe ponders this question in her most recent video installation, “Standardized Patient.” The work examines the relationship between doctors and patients—or, more accurately, between medical students and actors playing patients. Commissioned by the San Francisco Museum of Modern Art for its “New Work” series, Standardized Patient depicts a number of “Objective Structured Clinical Examinations” (OSCEs). In these simulated clinical environments, medical students practice communication skills with patients portrayed by professional actors known as “Standardized Patients” (SPs). The students take the SPs’ medical histories, ask about symptoms, offer diagnoses, and give recommendations, all the while being watched by professors, who later give feedback. Tribe’s work evolved from her collaboration with and study of professional clinicians, communication experts, and SPs at Stanford University and the University of Southern California (USC). For this video, Tribe developed four case studies and filled the roles with USC staff participants, medical students, and SPs trained to portray both patient and student characters. Kerry Tribe works primarily in film, video, and installation. Focusing on the mechanics of representation--particularly cinematic representation--its metaphoric potential and its engagement with reality, her art addresses processes of thought and their relationship to subjectivity, narrative, place and time. Employing image, text, sound, structure, and space, her work plays upon the internal workings and ingrained habits of the mind, its unavoidable quirks, flaws, and shifting fault-lines. Stimulating both reflexive experience and a reflection upon such experience, she prompts an unusual type of self-consciousness, a disorienting and discomforting awareness of the gaps between perception, cognition, and memory, the fluidity-and ultimate unreliability-of each. See the UK's first major exhibition of artists' responses to war and conflict since the terrorist attacks on 11 September 2001. Age of Terror: Art since 9/11 will feature more than 40 British and international artists. For more than 150 years the adventures of Lewis Carroll's Alice in Wonderland have moved not only the imagination of children, but are also inspiration for art, mathematics, physics and, of course films. As if in a dream Alice falls from one queer scene into another, and despite of the confusion and the nonsense she tries not to loose the thread. The roles are exchanged: In the story, Alice suddenly finds herself in the position of the adult and the rational. She grows, shrinks and jumps from one level of meaning to another, she finds herself in a world where everything is possible. A proper portion of curiosity is her great driving force. But also thanks to her tremendous self-confidence, she does not stop in spite of occasional fear. The exhibition area of the OÖ Kulturquartier with the OK in its great variety and complex architecture is an ideal backdrop for such a wonder world. Focusing on key elements of Lewis Carroll's classic, such as the dream, nonsense, the queer, time, order and chaos, but also play, the exhibition tells a wondrous narration with performative elements throughout the exhibition spaces. 1301PE is pleased to announce the opening of Kerry Tribe's exhibition, New Work, at SFMOMA. The exhibition premieres an SFMOMA commission by the Los Angeles–based artist and filmmaker that offers insight into the work of Standardized Patients—professional actors who portray patients in a simulated clinical environment as part of medical students' training. 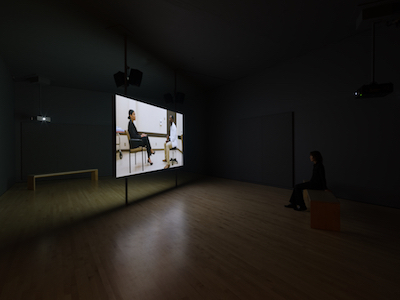 The multi-channel video installation explores questions of empathy, communication, and performance, and was developed through Tribe's close collaboration with professional clinicians, communication experts, and Standardized Patients at Stanford University and the University of Southern California. In this, Tribe's first solo exhibition at a major U.S. museum, the artist builds upon her history of engaging individuals from the acting and medical communities and exploring the willing suspension of disbelief. View of Kerry Tribe's "the word the wall la palabra la pared," Parque Galería, Mexico City, 2017. For her first exhibition in Mexico City, LA-based artist Kerry Tribe removed the front wall of Parque Galería and transformed it into a makeshift screening room. The crumbling architecture, with its exposed dry walls and frayed edges, introduces an exhibition in which seemingly solid physical and psychical structures are undone. Tribe's work addresses perception, memory, and language, as well as the technologies used to perceive, record, and describe experience. Combining video, sculpture, and photography, her latest exhibition considers how atypical circumstances—such as alterations in the mechanisms of reception and emission in the brain—create opportunities to analyze the norms by which fitness and unfitness are defined. By paying attention to the anomalous, Tribe tackles new, affective configurations of knowledge. PAMM will screen Exquisite Corpse, a 51-minute installation and single-channel film that follows the 51-mile Los Angeles River from its origins in the San Fernando Valley northeast of the city to its terminus at the Pacific Ocean. Using a detailed map as a script, Tribe's camera captures the river's varied landscapes, neighborhoods, inhabitants, and communities through a string of meditative encounters that collectively describe the site, and the city, at this juncture in its history. Tribe's film is shown as part of Faena Art's presentation of highlights from the Biennale of Moving Images, on view at Faena Art April 13-30, 2017. Tribe's new works in video, sculpture and photography playfully literalize ideas around linguistic communication, transnational relations and empathy. The exhibition continues Tribe's investigation of the "speaking subject" who narrates their experience for an audience. The show is organized around a video in English and Spanish called Afasia (2017) which features the artist's friend photographer Christopher Riley, who, at the age of 43, suffered a left hemisphere stroke that severely limited his ability to speak, write and understand language. Despite these challenges, he passionately communicates an appreciation of his life and the vast world around him. The video is projected in a make-shift screening room built from the remains of what had previously been the gallery's front wall. Top Five Buddy Cop Films is an exhibition of collaborations between five pairs of Los Angeles-based artists, curated by Santi Vernetti. On paper, the practices of Kerry Tribe and Edgar Bryan couldn't be more dissimilar. Tribe works mostly in film, video, and installation, while Bryan works mostly in painting, book design, and clay. What they share is a collection of overlapping interests and approaches to making. Both explore the boundaries and possibilities of gesture and representation within their chosen mediums. They also share a rich history of collaboration with other artists, friends, and strangers. A still of the Los Angeles River from Kerry Tribe's "Exquisite Corpse" 2016. 1301PE is pleased to announce Kerry Tribe's participation in the celebrated Biennale de l'Image en Mouvement (Biennale of Moving Images) at the Centre d'Art Contemporain Genève, Switzerland. Tribe's contribution, Exquisite Corpse, was commissioned for the 2016 CURRENT:LA Biennial and will be presented for the first time as a three-channel installation. Kerry Tribe, "Exquisite Corpse." | Photo: Panic Studio LA. "This summer, Los Angeles' riverbanks and water-related sites will blossom to life despite the drought... Across 16 locations (15 designated sites plus a "hub") from Bee Canyon Park in Granada Hills to Point Fermin Park in Long Beach, site-specific artwork and public programming by international and Los Angeles-artists will provoke visitors to ponder the tangled web of connections water weaves in our city's history." Join us for a screening of the only two films ever created by iconic LA-based artist Ed Ruscha, Premium (1971, 16 mm, 24 mins.) and Miracle (1975, 16 mm, 28 mins.). Premium, Ruscha's first film, starring artist Larry Bell and model Léon Bing, exemplifies the artist's deadpan aesthetic and his investigation of the codes of Hollywood storytelling. Miracle, a story about a curious day in the life of an auto mechanic, stars artist Jim Ganzer and actress Michelle Phillips. LA-based film, video, and installation artist Kerry Tribe introduces Ruscha's films; Tribe's work is included in LA's first public art biennial, CURRENT:LA Water, opening July 16, 2016. Felipe Lima will present Ed Ruscha: Buildings and Words, a new short-length documentary film about Ruscha's extraordinary body of work written and directed by Lima. 1301PE is pleased to announce Kerry Tribe's participation in Los Angeles' first public art biennial, CURRENT:LA, which will take place between July 16 - August 14 exploring the theme of 'water'. Tribe's contribution, 'Exquisite Corpse', is an open-air nightly screening of a 51-minute film that traces the 51-mile Los Angeles River from its origins in the San Fernando Valley to its terminus at the Pacific Ocean. Nightly screenings in Sunnynook River Park at 8:30 p.m. Pre-screening presentations by the Theodore Payne Foundation for Wildflowers and Native Plants every Friday at 7:00 p.m.
"Artist Kerry Tribe has a deeply ingrained sense of civic duty. When she noticed that the garden at her children's public elementary school was neglected, Tribe got her hands dirty and started planting. She tackled forestry issues in her Eagle Rock neighborhood by running for elected office. And when the city of Los Angeles approached her last summer to submit a project proposal for Current:LA Water, the city's first public art biennial, Tribe developed a large-scale piece that incorporates her passion for community and ecology."